December 7, 2018. New Delhi, India – St Stephen’s College is one of three founding colleges of the University of Delhi. It was first set up 137 years ago by Rev Samuel Scott Allnut and named after St Stephen who was adopted by the Anglican Church as the patron saint of Delhi after Christians were stoned to death in the 1857 turmoil. One of the most highly regarded colleges in India, it accepts graduates and under-graduates and offers courses in the sciences and liberal arts. The list of distinguished alumni, politicians, businessmen, artists, scientists and academics among them, is long. Today, St Stephen’s College’s Founder’s Day, His Holiness the Dalai Lama was invited to celebrations as the Chief Guest. Arriving on the college campus, His Holiness was welcomed by the Bursar, Dean and Senior Tutor who escorted him to the Principal’s office. He was introduced to the Principal, Prof John Varghese and the Chairman of the Governing Body, Rt Revd Warris Masih, who is also Bishop of Delhi. 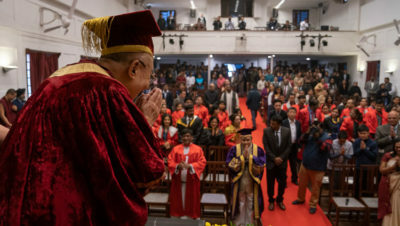 After donning the College’s red academic robes and cap, His Holiness met members of the faculty. He then joined the ceremonial procession into the hall. Once everyone had taken their seats on the stage and in the hall, the Principal asked Rt Revd Masih to lead an opening prayer. He recalled the qualities of the founder as a good citizen dedicated to the service of others and prayed, “May we be like that”. Acknowledging Rt Revd Masih, the Vice Chancellor of Delhi University and His Holiness, as well as other distinguished guests and dear students, Prof Varghese offered everyone present a warm welcome on Founder’s Day. He described it as a day not only to remember the founder, but also all those who have given their best after him. The College is what it is because of their efforts. He read out a long list of eminent teachers, scholars and principals, many of them members of the Cambridge Brotherhood, from the beginning up to the present day. Referring to His Holiness as a man of god, a man of the world and a man of peace, the Principal invited him to address the gathering. 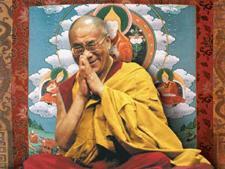 “I don’t like too much formality,” His Holiness began, “when we are born there is no formality. There is no formality when we die, so I prefer to take things easily while we are alive. Consequently, I’d like to start by acknowledging my respected brothers here on the stage and brothers and sisters here in the hall. Underneath these robes, we have the same kind of human body. We have the same kind of human brain. We are physically, mentally and emotionally the same. “According to your belief, we are all created by God and as children of a loving father we are all brothers and sisters. There should be no basis for us to quarrel or, worst of all, to kill each other. We are social animals; we survive in dependence on the community. Nowadays, we live in a global economy that reaches across borders. Similarly, we are all affected by climate change, which is clearly reflected in an increase in natural disasters on the one hand and a reduction in snowfall on the other. “All our religious traditions convey a message of love, so it is unthinkable that there are places where people are being killed in the name of religion. “Due to our brains and our marvellous intelligence we have developed language and writing so we are able to communicate and explain things to each other. All those who the Principal has just named worked in the service of education. They are no longer physically among us, but the fruits of their efforts live on. We should be grateful to them. I really admire their dedication. “As I was saying, we have this marvellous intelligence, but what is important to remember is that whether we use it constructively or destructively depends on our motivation. For example, harnessing nuclear energy was a huge achievement, but to then use it in weapons of mass destruction was very sad. Predatory animals like lions and tigers can be savage and ruthless, but they don’t kill wantonly, only when they are hungry. We human beings develop sophisticated weapons and engage in war—carelessly engaging in organized violence and killing. “The mistake is to resort to the use of force as a means of solving problems. This is why we must turn away from the pattern of the 20th century and make the 21st century an era of peace and compassion. Scientists tell us they have evidence that basic human nature is compassionate. Indeed our own experience is that when we smile and are friendly with others, we’re happy. If, instead, we treat others with suspicion, we’re unhappy. “Whether we’re religious or not, we all need friends. A mother gave birth to each one of us and survived because of her care and affection. Education is not just about enhancing our marvellous intelligence; it’s also about the need to develop warm-heartedness. This is a Christian college and the message of Jesus Christ was to love your neighbour as yourself. We should make that a part of our lives. Serving humanity is the way to use our intelligence constructively. “You young people, members of the first generation of the 21st century, please pursue your education with energy, but combine it too with warm-heartedness. There’s evidence that constant anger and stress undermine our immune system and limit our physical health. Cultivating a more compassionate, warm-hearted attitude, on the other hand, is good for our health. Principal John Varghese voiced his appreciation of His Holiness’s simple words of wisdom. He noted that His Holiness has already received numerous awards and requested the Bishop and Chairman of the Governing Body to add to them by presenting him with a badge in the form of the St Stephen’s College crest. He requested everyone to stand for the college hymn, ‘O God our help in ages past’, followed by the National Anthem.